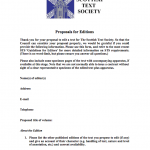 The STS warmly welcomes proposals for new editions of Older Scots texts, or re-editions of material that has long been out of print and is significantly in need of new editorial attention. If you would like to propose a volume, please fill out the Edition Proposal form below, and email this to the Editorial Secretary, Dr Rhiannon Purdie and to the President, Dr Nicola Royan. 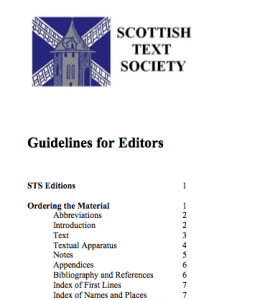 Specific STS editorial guidelines are also available for download below. Please note that the STS does not work with camera-ready copy: editors are asked to submit their editions as Word files.